Heating mat is the universal and easiest to fit UFH system. Available in 25 and 50 cm wide rolls and several standard lengths will fit almost every standard bathroom. Perfect to be installed under the tiles. Suitable with our wet room kits and stone resin shower trays. Underfloor heating mat price can be better than ours but in long-term having better quality system pays for itself. MAGNUM® Underfloor Heating mat 0,75 m² 25 cm x 3 m Magnum Heating The MAGNUM Electric Heating Mat 0,75 m² 25 cm x 3 m is a unique type of floor heating mat. The system has been designed to be used on an existing tiled floor or an existing finished floor, so that floor heating can still be installed there. The mat is approximately 4 mm thick and can be included in a layer of adhesive without any demolishing or grinding. The mat fits virtually underneath the surface. This decreases the heating time of the floor, that also makes this system suitable for rooms that are not permanently occupied including bathrooms, studies, playrooms, etc. The MAGNUM Electric Heating Mat is a unique type of floor heating mat. 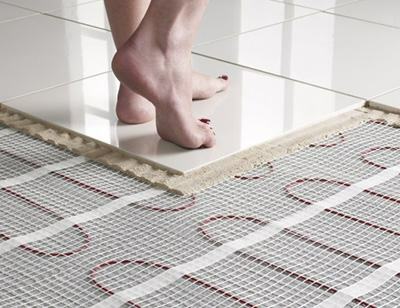 The system has been designed to be used on an existing tiled floor or an existing finished floor, so that floor heating can still be installed there. The mat is approximately 4 mm thick and can be included in a layer of adhesive without any demolishing or grinding. The mat fits virtually underneath the surface. This decreases the heating time of the floor, that also makes this system suitable for rooms that are not permanently occupied including bathrooms, studies, playrooms, etc. MAGNUM Mat is available in 22 different surface area sizes from 0.75 to 25 m². Because the heating cable connects through at the ends on the mat, the power supply cable is only on one side and invisibly secured using a unique connection. This means that a return to the thermostat is not required. MAGNUM® Underfloor Heating mat 1.75 m² 25 cm x 7 m Magnum Heating The MAGNUM Electric Heating Mat is a unique type of floor heating mat. The system has been designed to be used on an existing tiled floor or an existing finished floor, so that floor heating can still be installed there. The mat is approximately 4 mm thick and can be included in a layer of adhesive without any demolishing or grinding. The mat fits virtually underneath the surface. This decreases the heating time of the floor, that also makes this system suitable for rooms that are not permanently occupied including bathrooms, studies, playrooms, etc. MAGNUM® Underfloor Heating mat 2.5 m² 25 cm x 9 m Magnum Heating The MAGNUM Electric Heating Mat is a unique type of floor heating mat. The system has been designed to be used on an existing tiled floor or an existing finished floor, so that floor heating can still be installed there. The mat is approximately 4 mm thick and can be included in a layer of adhesive without any demolishing or grinding. The mat fits virtually underneath the surface. This decreases the heating time of the floor, that also makes this system suitable for rooms that are not permanently occupied including bathrooms, studies, playrooms, etc. MAGNUM® Underfloor Heating mat 1 m² 50 cm x 2 m Magnum Heating The MAGNUM Electric Heating Mat 1 m² 50 cm x 2 m is a unique type of floor heating mat. The system has been designed to be used on an existing tiled floor or an existing finished floor, so that floor heating can still be installed there. The mat is approximately 4 mm thick and can be included in a layer of adhesive without any demolishing or grinding. The mat fits virtually underneath the surface. This decreases the heating time of the floor, that also makes this system suitable for rooms that are not permanently occupied including bathrooms, studies, playrooms, etc. MAGNUM® Underfloor Heating mat 4.5 m² 50 cm x 9 m Magnum Heating The MAGNUM Electric Heating Mat 4.5 m² 50 cm x 9 m is a unique type of floor heating mat. The system has been designed to be used on an existing tiled floor or an existing finished floor, so that floor heating can still be installed there. The mat is approximately 4 mm thick and can be included in a layer of adhesive without any demolishing or grinding. The mat fits virtually underneath the surface. This decreases the heating time of the floor, that also makes this system suitable for rooms that are not permanently occupied including bathrooms, studies, playrooms, etc. Chat started. Session ID: 1556250428. You are now connected to: David M.